Think you’ve got your wedding budget all figured out? Not so fast! Hidden wedding costs like décor rentals, permits, and even cake cutting can quickly send your budget through the roof! Here are a few hidden wedding costs to be mindful of when planning your big day. Wedding envelopes weigh more than regular letters – many can cost up to $2 each to mail. While not a huge expense, many couples are not expecting a $300 postage bill when choosing a large design. Some hotels charge $5-$7 per bag they hand out to guests but might not advertise it. Both the wedding venue and the wedding band or DJ can charge more if the couple wants to go late (often after 10pm). These things can run up to 20% on top of costs – a huge difference. 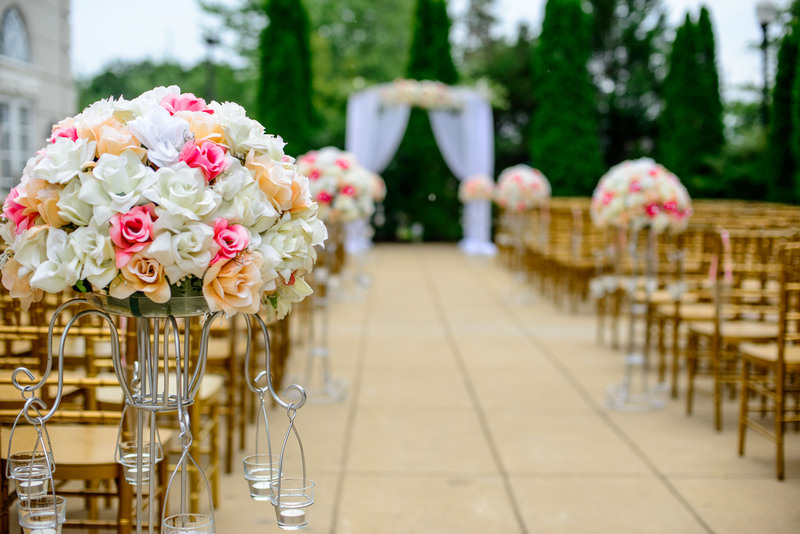 Choosing out of season flowers (like roses most of the year) can increase a wedding budget significantly because the flowers will need to be imported. Picking local, seasonal wedding flowers is better for your wallet and the environment. Many couples think that bringing in their own DIY wedding cake will save money, but a lot of venues have their own in-house pastry chef and/or a contract with a cake company. They require a cake cutting fee that ranges from $1-$7 per guest. If the reception space does not provide wedding décor like linens, china, flatware, tables or chairs, couples will find themselves stuck with a huge expense. For example, rental chairs can range from $2-$20 per chair, and rental delivery can run up to $500+. Things like décor, sound equipment, floral arrangements and rentals may require set up and delivery which, depending on agreements with each vendor, can add additional costs. Some venues include clean up costs, but others do not. These charges can run up to $750 for garbage removal, freight elevator use, and cleaning. If you want to make sure everything is recycled, be sure to ask ahead of time and/or arrange to have your friends or family pick up and deliver recyclables after the event. When doing the head count couples need to consider their vendors. These are often offered at a discount, but need to be inquired about. If they want to save money on wine, they may lose depending on the fees. Generally, wines over $20 a bottle make sense to pay cork fees on. Corkage fees also allow couples to bring in organic wine or a favorite that is not available on the menu. If planning a wedding in a public area, there are often permits and usage fees to consider. Couples and wedding planners should look online well in advance of the big day. Couples MUST have a backup indoor or tented venue. This plan, whether used on the day or not, can add cost. When it comes to the budget, hidden wedding costs are easy to avoid or factor in with a little planning. If you keep these hidden wedding costs in mind before you make big decisions you won’t get caught with a bill larger than you anticipated.